Self-myofascial release, also known as “foam rolling,” is a term for self-massage to release muscle tightness or trigger points. Foam rollers are fairly simple objects: light weight but firm, high-density foam tubes, +- 18 inches long and 6 inches diameter, and they may have a smooth or a bumpy surface. In general, you place the roller on the floor and position your body over it, and then roll over it, using the weight of you body to apply pressure and massages the spot where the roller and your body makes contact. Foam rollers have become popular exercise and physiotherapy aids, and something that I have felt great benefit from. Some CF factors that can contribute to stiff back muscles or sore muscles include coughing, posture changes due to lung infections and changes to chest structure, strange or upright sleeping positions, poor flexibility, low exercise tolerance, and CF related inflammation or joint problems. Don’t forget other non-CF lifestyle causes such as sitting too long in front of the computer. Upper back (thoracic spine) roll and stretch: Lie on your back and place the roller under your upper back, just below your shoulder blades. Lift your hips slightly, engage your core, then roll slowly on your upper back area. For the stretch: lower your hips, keep your lower back straight, place your hands behind your head for support, and relax into an arch over the roller. Hip flexors or outer thigh roll: Lie on your side, and lift your body enough to place the roller under your hip. Stabilise your core for balance, then roll slowly from hip to above the knee. Switch to the other side and repeat. Glutes: Sit on the foam roller (width-wise), and cross right foot over left knee and use your hands for support behind you. Lean in slightly as you roll, which will amplify the massage on your glutes. This can also help for sciatica. The following is not recommended: rolling directly on an injured area; rolling too quickly or making harsh motions; staying on one spot too long; and having a collapsed posture while you do the exercises. Instead, be sensible, don’t be extreme in the application, try to remain focused and have a stable posture while rolling. Take note that some professionals caution against rolling directly on certain parts like neck and lower back, so you should consult your medical professional or fitness instructor if you have any areas of concern. However, as a side note, I have had lower back surgery for something unrelated (long before I even had a roller) and have generally found the foam roller to be a very safe apparatus. I like it so much that I have been using it 5-10 minutes per day for almost a year now. I take it everywhere, including to hospital as I am prone to develop additional body aches while I’m sick, and this gives me some relief. Leave a comment if you have any thoughts on foam rolling, or other related exercises. Happy rolling! Written by: stylecomfy on January 29, 2017. These foam rollers look amazing! I will have to try one! How to enter to win one? This looks like it’d be great for my teenage cfer! He’s always complaining about shoulder pain…definately will look into it! Foam rolling would be great help to my 16 year old CF’er i have noticed more lately the rolling of the shoulders that is common in people with CF. Hi Maureen and Chris, to enter the giveaway there is a link in the newsletter that you need to click, which will let you send your submission through It is a big blue button just under the foam roller giveaway picture and it says ‘CLICK HERE TO ENTER THE FOAM ROLLER GIVEAWAY’ – let me know if you don’t find it. I tried the link for the giveaway and it does not work for me:( Looks like a great form of therapy. Hi Kristina, the link seem to be working for others, it is an ’email link’. I will send you a private email to explain more. I love using the foam roller at the gym! How do you win a free one? I have wanted to try one of these for my back for some time! I’ve heard nothing but good things about foam rolling. Would love to win one! UPDATE: The giveaway is now closed. Thank you for all the entries! Winners will be contacted via email. Thank you so much for the foam roller! We received it yesterday. My son with CF is 14 and always has knots in his back, I never considered this for him…can’t wait to see improvement! Very cool! I have issues with back pain, so I may give this a shot. 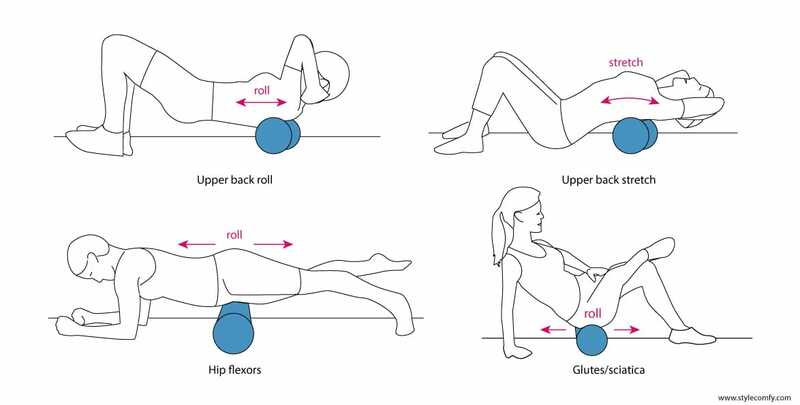 Now off to look at foam rollers…;) Thanks, great info!